This compact little photograph shows the fogou at Pendeen, the nearby house being the former seat of the Borlase family. Fogous are subterranean passages mainly confined to the western half of Cornwall, though similar structures can be found in Scotland and Ireland. Their purpose has been debated for centuries and proposed explanations include structures built for refuge, for food storage and for ritual. John Norden, writing in the late 16th century,1 described it as "Pendene vowe, a holl or deepe vaute in the grounde, wherinto the sea floweth at high water, verie farr under the earth: Manie have attempted, but none effected, the search of the depth of it." In fact the fogou is a mere 24 feet long. 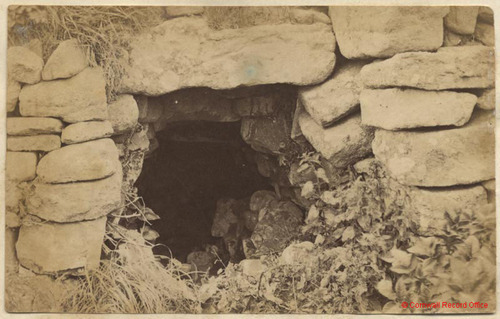 Image courtesy of and © Cornwall Record Office.